Bullying Prevention and Intervention, authored by Swearer, Espelage, and Napolitano, offers research-based information and practical strategies for dealing with bullying in schools. Published in 2009, the book is organized into nine chapters, beginning with a comprehensive understanding of the bullying phenomenon and a description of bullying patterns across grades. Considering the socio-ecological nature of bullying, the authors consider bullying as a relationship problem and provide realistic suggestions that involve school staff, parents, peers and the community in addressing the problem. Concrete steps for developing, choosing and implementing anti-bullying interventions and policies are provided, and the authors address legal issues regarding bullying for school personnel (applicable to the U.S.), and the impact of technology. Of particular interest is a chapter on how schools can leverage the resources they already have on hand in their anti-bullying efforts, including collecting and analyzing data on school climate to inform strategies for enhancing social relationships within the school. 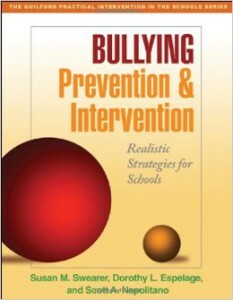 A detailed process for evaluating anti-bullying efforts in schools is offered in the last chapter. Reproducible handouts, such as evaluation forms, activity worksheets, and even a bullying book list are provided. Citation: Swearer, S. M., Espelage, D. L., & Napolitano, S. A. (2009). Bullying prevention and intervention: Realistic strategies for schools. New York: Guilford Press.